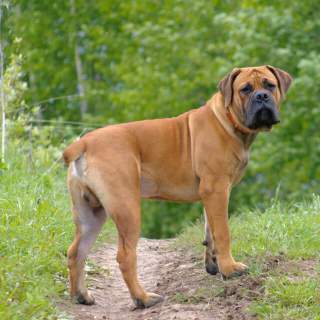 The Boerboel is primarily a guarding dog that originated in South Africa During the mid 1600s; the name translates roughly to "farm dog" and this breed was, indeed, protector to the early Dutch and British settlers to the Cape area. The best match for this breed is an experienced owner that has a nice yard and plenty of time to spend with them each day. They are intelligent, obedient and easy to groom. They do require a moderate amount of daily outdoor exercise. These dogs are calm and affectionate family companions that are also good with other pets IF well socialized. Supervision is recommended for this breed at all times and it may not be legal to own one in your area. 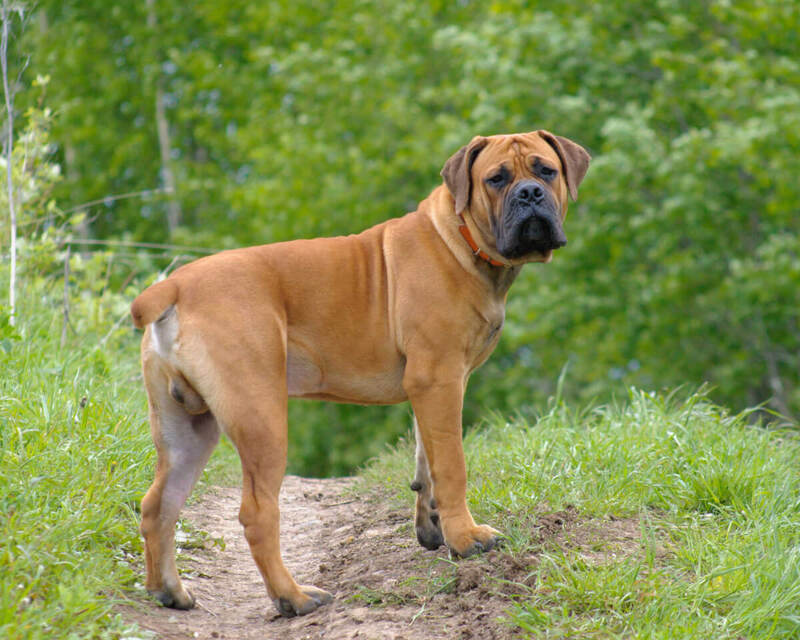 Boerboels are generally healthy and typically live around 10 years. This breed is everything one could want as a body guard or household guardian. Let's start with the appearance-- looks alone reveal plenty of Boerboel information. He/she is large to huge, well muscled and, most importantly, calm and confident. The blocky, broad head, itself, looks powerful with the robust jaws and slightly wrinkled forehead. The body is solid and also blocky with with a strong, straight back and muscular legs. The pigmented skin is loose but not wrinkled and is covered by a short, smooth (and glossy) coat. 1. Intelligence- An obedient yet confident demeanor helped this breed evolve and adept in new, harsh terrain. 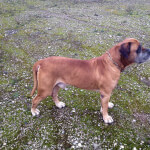 They are not very difficult to train for an owner experienced with large breeds. It's absolutely imperative to firmly establish yourself as the leader or else your Boerboel certainly will. Positive reinforcement and confidence are the two things needed to effectively train him/her. Socialization should take place immediately to prevent an over protective dog-- towards both animals and people. 2. Kids, Strangers, Pets- These "velcro dogs" may develop behavioral problems if not allowed to spend enough time with you every day. Members of this breed make top notch family companions; they will be affectionate playmates for children and protect the family to the death (if necessary). That being said, they will remain suspicious and aloof around strangers, if well trained, but may be aggressive if not. The same goes for other pets (especially dogs) as a well socialized Boerboel can exist well with other pets but, if not, may be aggressive towards other dogs. 3. Exercise- Although they may be lazy indoors, if allowed, this breed is large, powerful and needs adequate daily outdoor exercise to keep them in shape and productive. 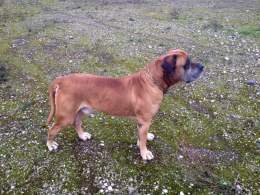 The Boerboel wiki recommends a minimum of a long daily walk but, ideally, an hour of outdoor exercise/playtime is best. A securely fenced yard is also recommended. A bored Boerboel is a destructive one. However, there is a general consensus that Boerboel history begins in 1652 when Jon van Riebeeck was sent to the Cape of South Africa by the Dutch East India Company. The waters around this area were important trade routes by this time and Riebeeck was to establish a trading post in the area. He was not only accompanied by fellow settlers but also large Mastiff-type Bullenbijter dogs that were luckily strong enough to survive in this difficult new terrain . 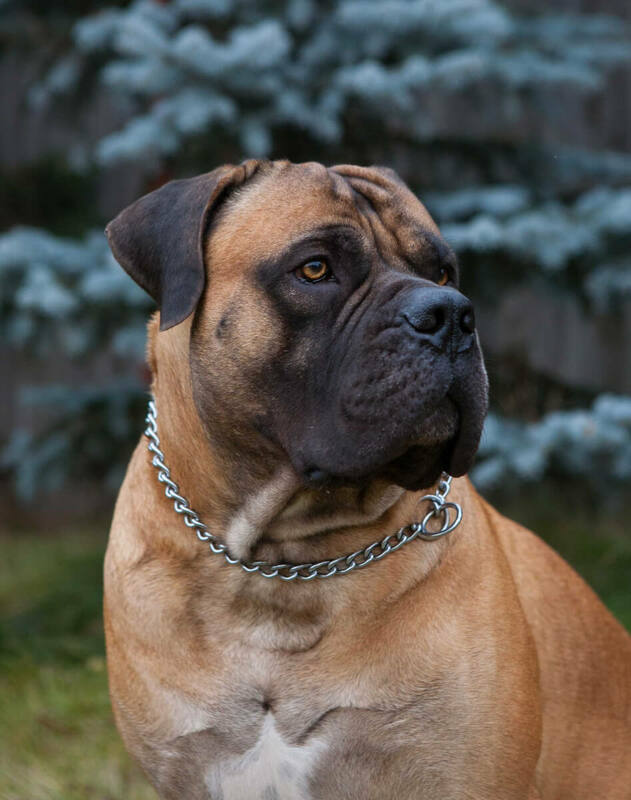 Although it's unknown exactly what breeds intermingled to create this massive guardian, the arrival of English settlers in the early 1800's added several new Mastiff and bully breeds into the mix. These dogs cross bred with native south African dogs and were utilized by the settlers for the protection of person and property-- not to mention they were excellent family companions. 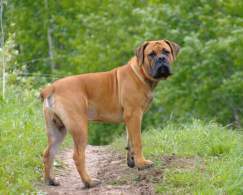 It's also worth a mention that the De Beers diamond mining company brought Bullmastiffs to guard the mines, although by that time Boerboels already existed as a distinct breed; the interbreeding still likely shaped the modern Boerboel breed. 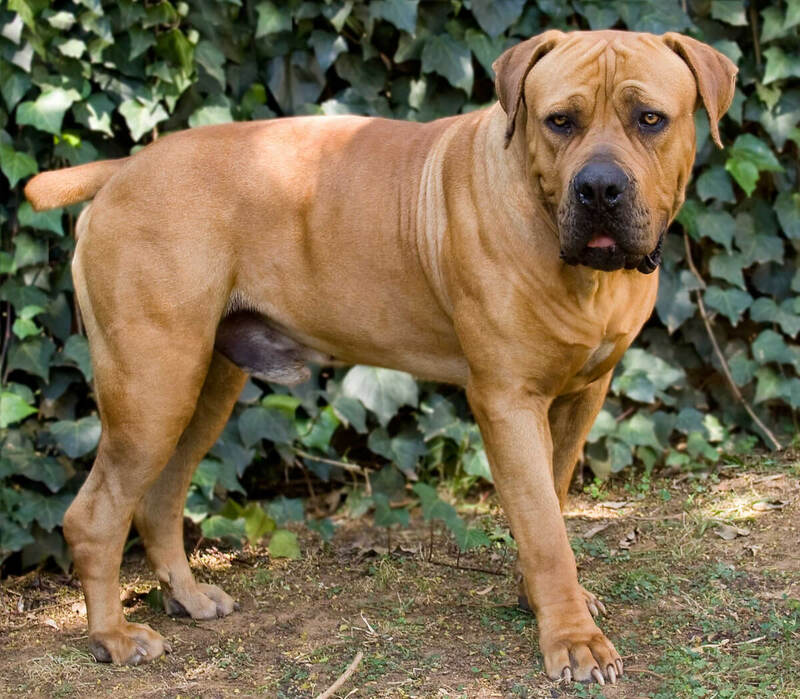 The South African Boerboel Breeder's Association was founded in 1983 and several other organizations have arisen from this group including the South African Boerboel Breeder's Society (2014). The breed was officially recognized by the AKC as recently as 2015. 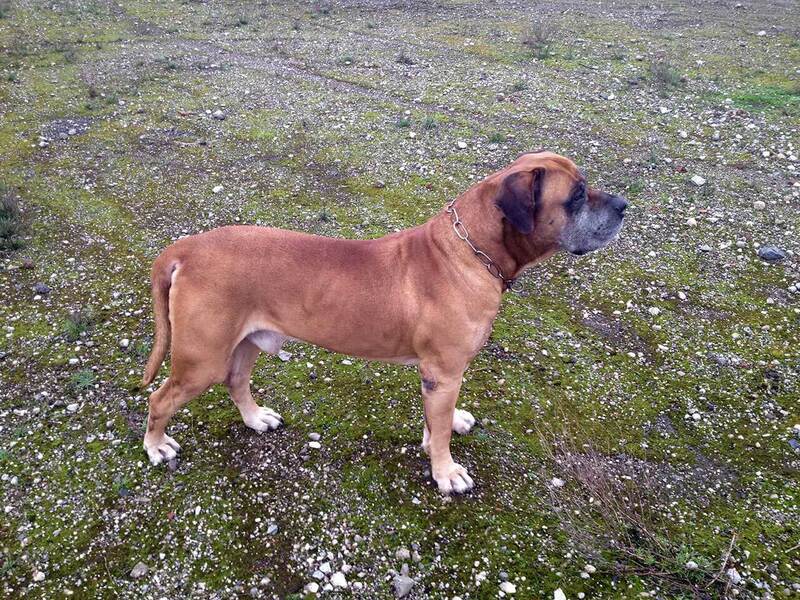 Boerboels are large, heavy dogs perfectly suited for their guardian duties. Height at the shoulder should be 22-25 inches for females with males reaching 24-27 inches. A fully grown Boerboel's weight is not as specific as the height but is usually 110-143 pounds for females and 143-176 pounds for males. There is, instead, an emphasis on proportion and ability to fulfill duties by being in good shape and good health. 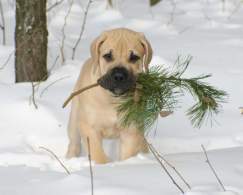 There aren't different Boerboel types, per say, but overall size may vary among individuals from big to huge to GIANT due to the emphasis on proportion and health rather than size standards. 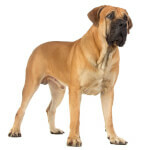 Generally, female weight caps off around 140 pounds and males 175 pounds, however, the biggest Boerboels may certainly surpass this. Keep in mind that many photos and stories you encounter online of the 300+ pound "Biggest Boerboels in the World" are likely hoaxes-- but to be sure, these are always large dogs. Among the best facets of the South African Boerboel temperament are her intuitive intelligence, obedience, confidence and protective nature. Members of this breed are both clever and intuitive so training CAN be easy and enjoyable since they are also obedient dogs. This all depends upon whether you have experience with large dogs; confidently and firmly leading your Boerboel as the alpha is a must for a well behaved pet. Failure to do so may result in an overly protective or aggressive dog with destructive habits. Another interesting Boerboel characteristic-- these dogs are considered "velcro dogs" that will want to be near their family/owner as much as possible. They aren't necessarily needy and can spend reasonable amounts of time alone yet they may become bored and lonely (aka destructive nuisances) if not allowed daily interaction with "their people". If socialized early, this breed's personality allows them to mesh well with other pets, however, some may be aggressive towards other dogs. Strangers and even acquaintances may find your Boerboel suspicious and aloof, but a well trained and socialized member of this breed will be able to distinguish between threat and non threat. It goes without saying they make excellent guard dogs that will defend their family to the death. 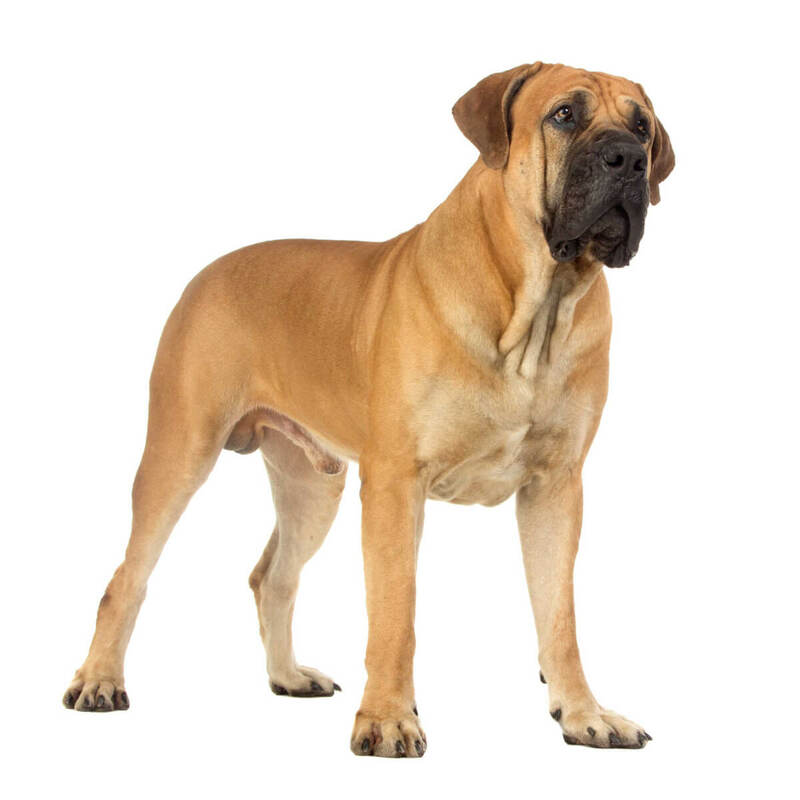 If you have the experience to handle a very large (and sometimes aggressive) breed, the Boerboel makes an excellent family dog and, in fact, has been primarily chosen for his abilities as a household guardian. The Boerboel temperament around children is calm, laid-back and, of course, watchful. As "velcro dogs" they will enjoy the attention a well behaved child can provide them and return it with playful affection. Keep in mind, this is a very large dog that may pose an accidental hazard to a child such as knocking them over; all dog breeds should be supervised around babies. 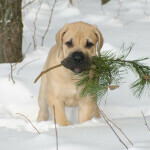 Unfamiliar children should also be introduced carefully and under supervision to well socialized Boerboels. Below are pictures and images of the Boerboel dog breed. 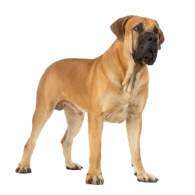 Owning a Boerboel is certainly a responsibility recommended for experienced dog owners only. A great deal of time will need to be spent training and socializing them so they do not become over-protective and can coexist well with other pets. It's worth mentioning that this breed, although low maintenance in regards to grooming, is not hypoallergenic and sheds regularly. Barking is to be expected if they need to alert your to, say, the approach of a strange person or dog but is not excessive. These intuitive guardians truly are devoted to you and will enjoy living inside where they can be in your presence. Although they need daily outdoor exercise, they are usually calm and laid-back indoors-- even lazy, if allowed. Keep in mind, you may come back to a destroyed home if they do not receive enough mental and physical stimulation. If they need to be housed outdoors, make sure your yard is of ample size and very securely fenced.